1. This job Application Send Hard Copy which submit by Post Office/Direct. 6. Project Expiration: 5 years. Educational Qualification, Experience and Salary: Please see the advertisment. Every Interest ligal canidate Name (Begali and English), Father's Name/Busband's, Mother's Name, Permanent Adress, Present Address, Self District, Date of Birth (Educational Qualification Certificate), Age on 31-10-2017, Nationality, Riligous, Educational Qualification, Muktijudda and other information (if any), Answer VDP information(if any), Experience (if any). a. Recent passport size photo 3 (three) copy photo(Attested by 1st class govt. officer name and post). b. Every Educational Qualification Certificate and Mark sheet Photocopy (Attested by 1st class govt. officer name and post). c. Character Certificate (Attested by 1st class govt. officer). f. Must include return 10 * 4.5 inch envelope with write candidate present address and attached 10/- taka post ticket. Department of Youth Development Authority will send you Admit Card by Post. Also you can visit update news at http://dyd.gov.bd/site/view/notices. Department of Youth Development Authority will send you Admit Card, Exam Center and Location. Also you can visit update news at http://dyd.gov.bd/site/view/notices. 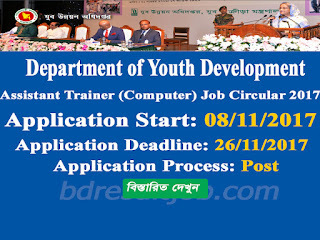 Department of Youth Development Authority will published on Notice Board at http://dyd.gov.bd/site/view/notices. 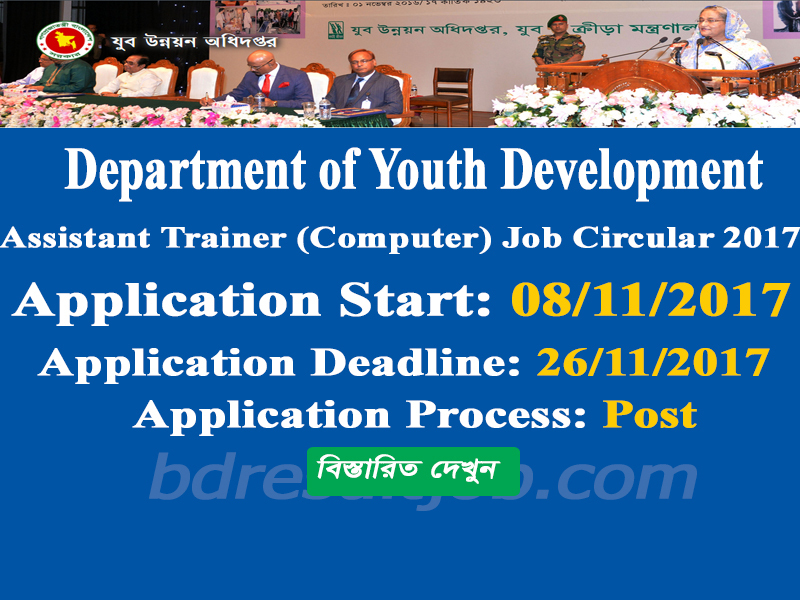 Tags: www.dyd.gov.bd, www dyd gov bd, Department of Youth Development Assistant Trainer (Computer) Job Circular 2017, Assistant Trainer (Computer) Job Circular 2017, Department of Youth Development Assistant Trainer (Computer) Job Circular 2017 Job Exam Result 2017, Department of Youth Development Assistant Trainer (Computer) Job Circular 2017 Job Admit Card 2017.